Jack is a small white dog who lives in Mexico City and has been missing since a magnitude 7.1 earthquake startled both humans and their pets when it struck early Tuesday afternoon. “I got lost in the earthquake!! !” a sign with his picture taped to a tree exclaims. Around Mexico’s capital are scattered signs for missing pets, mostly dogs, who their owners believe got scared and escaped in the chaotic moments after the devastating quake. Rescuers have found some skittishly wandering the streets and taken them to shelters. They know they are someone’s pet because they are clean, friendly and appear well nourished. 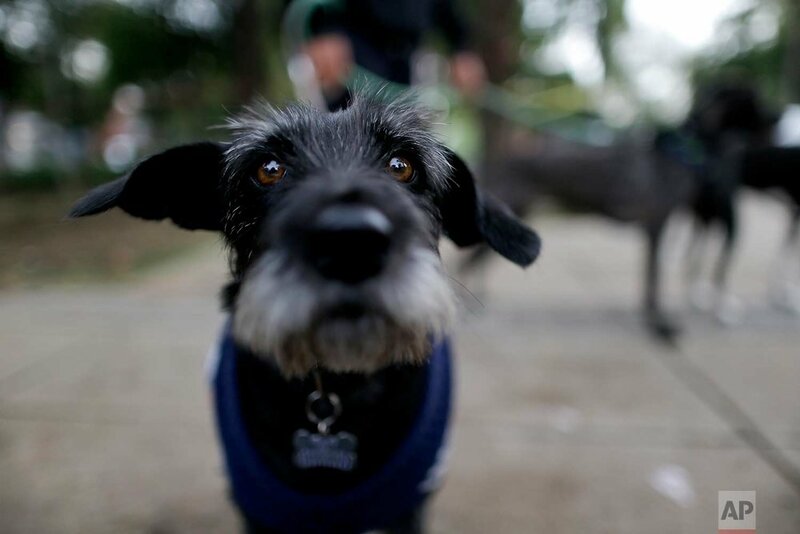 No one knows for certain how many pets are missing but many of Mexico City’s hardest-hit areas are filled with dog-friendly restaurants, parks and upscale groomers. A video of rescuers pulling a Golden Retriever from the rubble of a fallen building went viral the day of the quake. Trained search and rescue dogs are helping volunteers search for signs of life. Countless other animals have had to flee with their owners from buildings still in danger of collapse. Garcia’s Casa del Mestizo — the House of the Mutts — is on a street still roped off with yellow caution tape. Already brimming at full capacity before the quake, she had to tie one new arrival to a staircase because there was no more space. The black dog with piercing brown eyes was found with a collar but no tag. Outside the shelter are signs for six dogs their owners are still searching for: Baldo, a medium-sized beige dog with a black nose who went running down Bolivar Street without his collar on during the quake; Barack, a charcoal-hued canine with a short tail and one white paw; Bola 8 (Eight Ball) and Baileys, two Pomeranian pups, one wearing a bow; Kaplan, an American Bully whose owners say he has a small circular scar near his chest; and Kurama, another Pomeranian who went missing while still wearing his red collar with a tag. Owners like Mariam Luzcan, 38, have gone from one shelter to the next, looking for their pets. “We have every hope she will return to us,” Luzcan said of her dog Solei, a Dalmatian-like dog with one black ear and dark-colored patches of hair around both eyes. 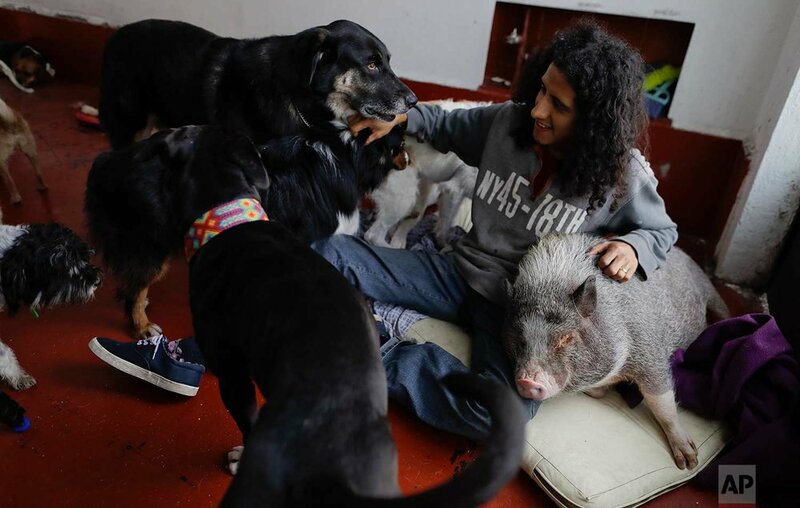 Luzcan and her husband run an animal rescue home to 50 dogs and one pig named Jacinto. During the quake, Jair Luzcan said the dogs ran around their playroom in circles, nervous and uncertain where to go. Two adjacent towers began to collapse, and rocks filled their building’s garage. The couple put leashes on the dogs and wrapped Jacinto in a blanket. But when they tried to leave their building’s only exit they found it blocked with a ladder. Rescuers told them that there was a gas leak and needed to leave immediately. They urged them to leave the animals behind. “We can’t live without them!” Jair Luzcan implored. The Luzcans said they pushed the ladder aside and fled with all 51 animals. A woman came to their aid and together the three pulled the mass of pets to safety. But at some point along the way Solei disappeared and hasn’t been seen since. “Our daughter went running,” Miriam Luzcan said solemnly. On Friday, she continued circulating a digital flyer with the dog’s picture on social media, one more in the crowded web of canines peering out of missing pet posters. The sign for Jack the white dog shows him in several colored pictures, smiling for the camera as a man squats down and lifts up his front paws, his tongue hanging out. The sign is placed in a plastic binder sleeve and taped around a tree on a street filled with popular bars and coffee shops. When he went missing, Jack was wearing a collar with his name and owner’s phone number on it, leaving some hope that he might yet be found. “Help me find my parents!” the sign cries out. Text from the AP news story, Have you seen this dog? 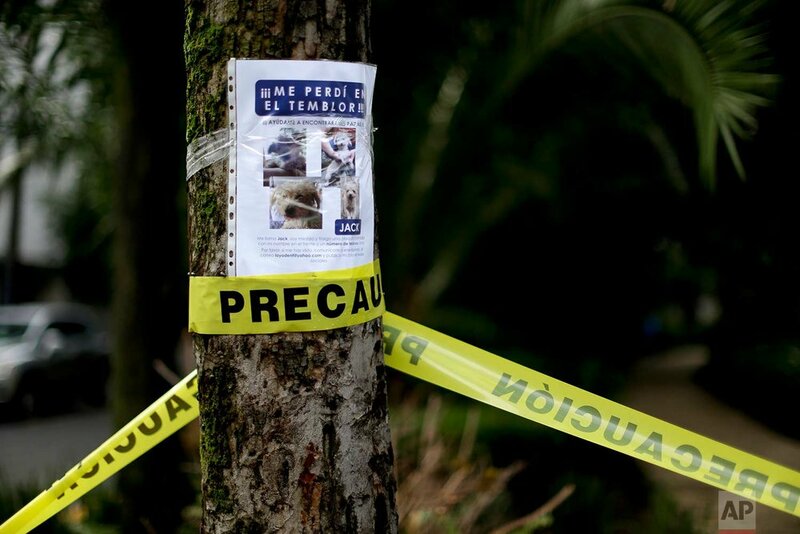 Mexicans search for missing pets, by Christine Amario.